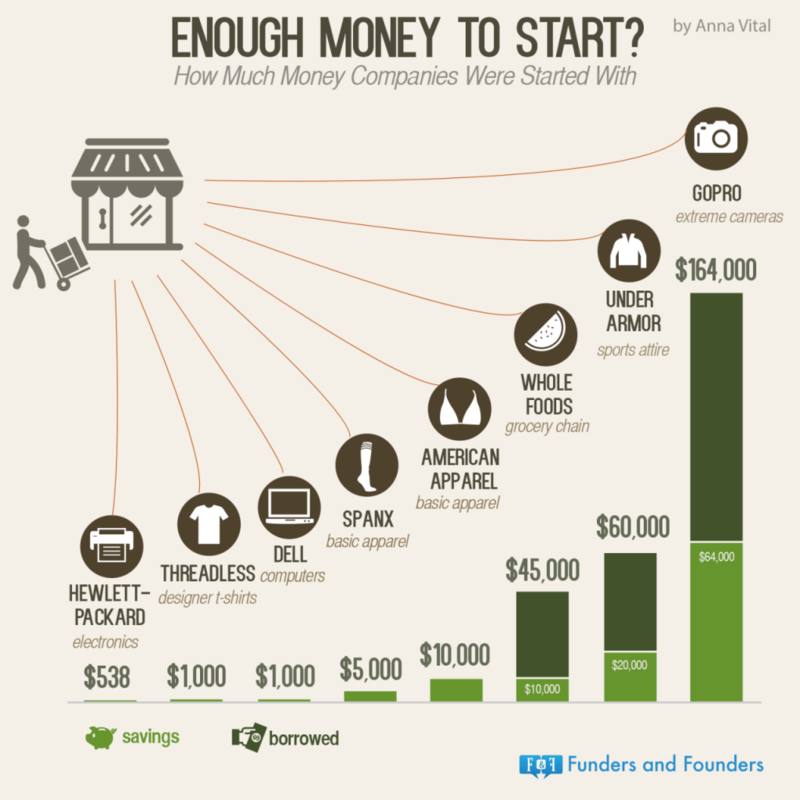 Just how much do you need to begin a startup? Capital is always tight for startups. It’s why so many of them are found in people’s garages or exist only on a WordPress website without any physical location at all. There’s nothing wrong with starting small, and many ventures have turned into successful companies with surprisingly small initial investments. How much money did major companies start with? No matter how much or how little capital a new business has, it is critical that these funds be appropriately allocated. Blowing a huge chunk of money on space in a trendy office building or on fun extras like a foosball table and a cappuccino maker is rarely a good idea. However, there are other areas where it makes sense to splurge. Doing so gets the venture started off on the right foot and helps to ensure future success. That penthouse office with spectacular views will come in time. Many entrepreneurs make the mistake of putting off meeting with a lawyer. They think it’s too expensive, and they figure that they understand their industry well enough to not need much in the way of guidance. This can be a costly error. Before getting too far into the business planning stages, it is incredibly wise to meet with a qualified business attorney. Even a couple of hours of advice can make a huge difference in the success of your venture. From choosing the right legal structure for your company to getting some boilerplate contracts on paper, you’ll probably be surprised by how much a good attorney can help you. Most attorneys will let you hire them on a pay-as-you-go basis. It’s smart to get a relationship started now before your company begins operations. Most entrepreneurs are blindsided when they learn how often new companies get sued, so having at least an acquaintance with a legal professional will also give you somewhere to turn in an emergency. New or well-established, most companies will not be successful in today’s economic climate without a fantastic website. However, no amount of punchy content and colorful graphics can make up for a website that takes forever to load or is difficult to navigate because it’s constantly stalling. If you’ve never built a website before, which is the case for many entrepreneurs, then you may be tempted to go for a cheap package deal that gives you a domain and a web host for just a couple of bucks a month. This can be a major mistake because that tiny monthly fee probably means that your website will be housed on a shared server. Shared hosting means that you’re sharing storage for your web content with an unknown number of other users. You may have an extremely limited amount of storage capacity and little or no control. On the other hand, a dedicated web host may be far more scalable and secure. When you choose a dedicated web host, your website is the only one on that server. That gives you more bandwidth and greater disk space as well as a lot more uptime. You’ll also have arguably better security, and your website will be able to perform optimally at all times, even if you have a rush of customers visiting. It’s a rare operation these days that doesn’t run on computers. If all of your data is stored only on your computer, though, what happens when that computer gets lost or just gives up the ghost? Does it mean you have now lost all of your customer contact info, copies of contracts and correspondence with vendors? Let’s hope not, but it happens. Whether your business has one computer or 100, it is critical to invest in an excellent backup system. It does not necessarily matter what backup platform you choose. It is simply essential that you have one. Acts of God, terrorism and cyber attacks should not be allowed to interfere with your ability to deliver to your customers. With a good backup system, you can rely on smoother operations. It is not absolutely necessary that you hire a designer to make a flashy website for you. In fact, website-building platforms like WordPress make it really easy for even a novice online entrepreneur to craft an incredibly professional website. Building your own website enables you to add all sorts of apps and tools that are designed to give your customers a better, more interactive experience. Plus, they can help you to connect with customers and potential customers via social media so that browsers become buyers. Speaking of buyers, some tools are designed to turn your website into a storefront. This is especially valuable if the majority of your business will be conducted online versus in a brick-and-mortar location. The easier and more efficient it is for your customers to browse, select, and check out, the more likely they are to shop and to come back for more. Your website will perform even better when you pack it with valuable, well-written content. A blog is a great place to start when you want to introduce yourself, your company, and what you can do for your customers. With a blog, you can keep your audience up-to-date on the latest innovations and happenings at your company and throughout your industry. Let your customers know about sales and remind them about the products and services you offer through your blog posts too. Your startup team may be small, but it is vital that they be hand-picked and passionate. Choose people who are willing to weather the sometimes tumultuous ups and downs of a new business venture. Their knowledge, experience and commitment are key to the success of the company. Make certain that they are willing to be almost as invested in this as you are. Ideally, your partners or employees will have skills and strengths that complement yours. If there is some area of your industry or the market that you don’t understand or have little experience with, hire someone who does. This minimizes the number of vulnerabilities you’ll face in the first several years. First impressions speak volumes. When potential customers see coordinated brochures, business cards, and letterheads, they are immediately impressed by the professionalism of your operation. Add to that a slick, well-produced website and you’ll be able to sell yourself to people as a company that knows what it’s doing. You may consider hiring a graphic designer to create a great logo for you. Consistently place that logo on all business correspondence, your website, and your business cards to present a cohesive look to the world. Think of this as building your “brand.” When your customers see that logo, your company should automatically come to mind. Ideally, that logo will inspire trust and peace of mind in customers. They’ll remember what a great experience they had working with you last time and that will inspire them to contact you again. Don’t make the mistake of skimping on these six critical areas where it makes sense for a startup to spend more. Keep in mind the adage that you have to spend money to make money, but ensure that you’re spending it in the right places. Do that, and you’re much more likely to succeed.